With the 175 years’ celebrations very effectively completed it seemed a fine opportunity to interview Carol Marlow, the energetic Managing Director of P&O Cruises. Something of a coincidence a review of Ventura – 115,000 tons and three thousand plus passengers follows. Carol joined Carnival UK in 1997 to run the then recently acquired Swan Hellenic (and Minerva II), having enjoyed a career in marketing and general management in the travel and broadcast industries. 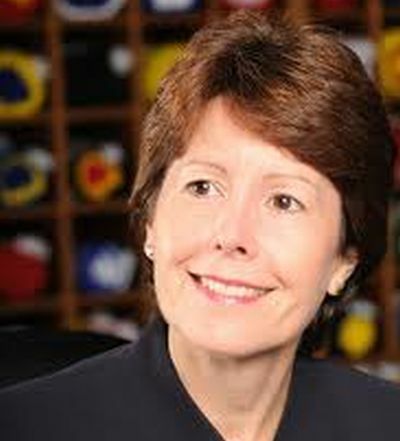 With the decision not to operate a one ship brand (but actually keep the one fine ship) Carol moved on to Princess, then Cunard, and in 2009 to P&O, Britain’s largest British cruise line, which Carnival had acquired in 2002. Today she is in charge of an operation with seven ships and one more on the way. On any given day some 14,500 clients are on a P&O cruise looked after by over 6,000 staff. In 2015 P&O will introduce a brand new 144,000 ton 3,600 passenger vessel, Britain’s largest ever cruise ship if you consider QM2 to be an Atlantic liner that also offers cruising. It is clear that the new ship will be innovative but essentially offer the traditional on board package that is successful now, and in the past. 95% of passengers are from or from the UK, or at least consider it their home. Even on the World Cruises (offered by Adonia 30,000 tons 710 adult passengers; Arcadia 83,700 tons 2016 adult passengers; Aurora 76,000 tons 1,874 passengers) this only drops to 90%. The 2013 programme has been published with 2014 due out in September. The full 2014 schedule will available next spring. Regarding the new ship’s name it seems that this will be up for discussion over the coming month or two. Staff and clients will be asked. Perhaps they will run a competition. There is currently no Canberra, Orcades or Oronsay, or Strath’s, to name but a few. Canberra (HMS Canberra) served with distinction in the Falklands and was not only the home to 6,500 troops, but at one time 3,100 prisoners of war. She steamed 3m miles and carried just under one million passengers in 30 years. As things stand P&O will be operating eight ships towards the end of this era, all of them likely to be based at Southampton over the summer months, although another home port cannot be ruled out. As it is P&O sails virtually 100% on every cruise. Going on board you will usually see the notice “ship full – no upgrades available”. The adult only ships have been a great success, 4,600 berths on three ships. 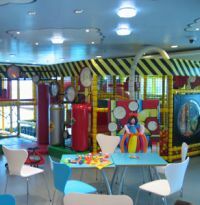 On each ship the children’s space has been usefully filled with leisure facilities, and in some cases cabins added. Whilst the nominal capacity is just over 10,000 for the four family ships this number can be substantially increased, particularly in the summer holidays, with the use of stowaway accommodation. 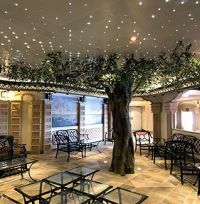 P&O has only in recent times swopped over to a cabin and waiter inclusive service +charge (£3.50 per passenger per day –but it is not compulsory). Ms Marlow points out that from under £100 per day P&O offers terrific value for a fully inclusive touring holiday including full board and entertainment. The bars are British pub style with no tipping. With her restaurant and hotel background, she was Marketing Director of the Forte Posthouse and Traders Restaurant brand, she is well versed in the running of what is for practical purposes a group of mobile hotels. 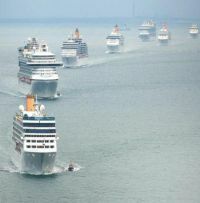 The future of P&O seems assured. What we need to know is the name of the new ship. Never been on a cruise? 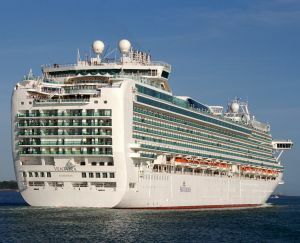 P&O has a programme of short trips of out Southampton on all its seven ships with a duration of two to seven nights. These are perfect if you have never cruised before and are proving popular with groups, family and others who want to get away for celebrations and get-togethers. You cannot really gain the full atmosphere of a longer voyage as everything is compressed, but it is a perfect introduction. Once out at sea the shops and duty free are open, as is the casino. No 20% VAT. Your Editor and his wife have cruised many times, on big ships and small. 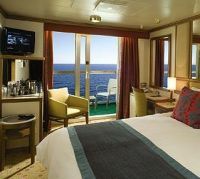 Just before the Olympics P&O had on offer, at very attractive prices, four nights away on Ventura, described as a larger ship, and family friendly. It seemed an ideal time for a break and an opportunity to update oneself on a 3,000-passenger vessel (plus children) now four years old and in her prime. As it was we quickly discovered that for nearly half the passengers it was their first cruise. There were virtually no Americans or Colonials on board. P&O aims at the UK market. Only three-pin electric plugs too and a daily British newspaper. The ship has full internet facilities. We decided on an inside cabin, always a subject of debate. There are those who say that they offer such terrific value they should not be turned down. We all agree that with no natural light coming in they are ideal for a good night’s sleep. The size of the actual accommodation is the same as those with a balcony but you cannot slide the door and go outside and quietly read a book. The washroom/shower unit is the same, compact but more than adequate. However, it is possibly the last time inside for us. One bit of fun was explaining ‘rules’ of seagoing to first timers. Yes you can dine first or second sitting, but it is up to you . There is an alternative waiter restaurant for ‘flexible dining’ open from 06:00 until 21:30. And always for the first few days take the small ship’s diagram with you. As it was Ventura is well signposted internally. People asked why for the most part we used the stairs. With a cooked breakfast, lunch, tea and dinner (plus ice cream if you want to buy during the stay) it is the only simple way to keep the waist size down. Ventura does not have a walk around promenade deck, but there is fine gym and associated spa. We tell people to book early if they want to use the (chargeable) beauty salon facilities. If you sit down to watch a cabaret act in one of the ship’s theatres and a member of the staff approaches you regarding a drink don’t feel embarrassed to turn them away. The trip did impinge in the school holidays, and there were 500 children on board, but other than being seen, and taking up plenty of room in three pools they were allowed to use, they caused no problems. Called “The Reef” the kiddies area is high up on the Sun Deck and divided into four age groups from two to 17. The very tiny ones are welcome too and provided with all the infant necessities. The Night Nursery (under five) and Slumber Time (5-8) operate free of charge up to 02:30. Also available is an in-cabin listening device. Our enquiries indicated very happy children, even those that used the pull down ceiling bunks, or extended sofa. For those less able to get around Ventura makes you feel very welcome virtually the whole ship accessible and a small number of special cabins available. On a number of ships the main self-service restaurants (open 24 hours in this case) have a canteen feel to them. This is not so with Ventura where the Waterside Restaurant on the Lido Deck is very well laid out. The choice is extensive but do not expect cordon bleu cooking. If you are looking for something special Marco Pierre White has a restaurant on one of the highest points on the ship, overlooking the stern with al fresco availability. This is for serious diners (£30 per person). On Ventura the Beach House is an evening transformation of part of Waterside, a limited and non-changing menu, but a lovely area for a meal, quiet and relaxed, watching out towards sea. The ship also offers Ventura East (£10 supplement) with various oriental flavours. It seemed to be very popular. Even on a short cruise there was themed partakings, part of the package, the Indian being very authentic, at least according to our waiter. Our short cruise took in Zeebrugge and Le Havre, with both ports providing a courtesy coach to the centre, and also Guernsey, where the ship’s tenders were used. If you get your timings right there will be no queues either way. We told first timers to get off early and come back fairly late. Or go lunchtime. And Ventura waited for some who should have missed the ship. We departed nearly one hour late. I do not recommend you do this as the captain is within his rights not to wait for any latecomers..
Southampton is Britain’s largest passenger ship port and is easy to get to down the M3 from London and M6/A34 dual carriageway from the north. Trains also connect from all over the country and there are plenty of scheduled flights to Southampton Airport. This time we drove down from London and used the excellent parking facilities. Just make your way to the Ocean terminal where you will be surrounded by porters. Very reasonable valet parking is on offer too. On your return collect your vehicle after a very short walk. In our case we were on board within 30 minutes of arrival. An alternative is P&O’s coach service from various regional points and Heathrow. Just give your case to the driver and expect it in your cabin soon after arrival. With a short trip you can carry your case on board, but always let the ship take care for disembarkation. For those interested in the technical side of things Ventura is a later variant on the highly successful Grand Princess series originally contracted by owner Carnival in the mid-1990s, but with an extra deck, rather like Caribbean Princess. Regulars will notice the fairly standard layout with the slab sided stern incorporating many, many suites of varying sizes. Ventura has a sliding roof over one of the four pools, essential for a ship that spends much of her time in the Northern hemisphere. Azura is her sister ship, also family friendly, for the most part much the same, a large open deck cinema screen replacing the sliding roof over the pool and the themed dining more Italian.